Flush Designs: Where am i? I've been updating our photo blog so much I just have been ignoring my own... I have a project I am thinking of right now in the world of flowers... but trying to find the time to do it might be a hard one. I went on a hike today with Erin and saw the most wonderful wildflowers that I might just go out again tomorrow with some cutting shears and cut myself enough to make a bouquet. Just for fun. I also really want to learn how to do my hair like this. I'll be around here and there but Please follow our photo blog we have so many exciting weddings coming up! 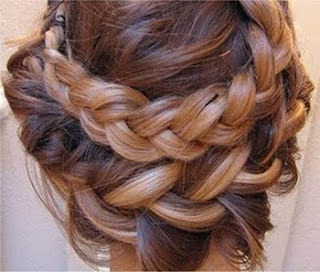 Braids have been all over the place lately - on the runways, red carpets, in wedding mags...everywhere!